I made a Facebook event and invited my friends to “donate” to my project. I got more than half of what I needed for my penny floor template from doing this. The rest I got in quantities of $10-$20 from the bank as I worked on it. It’s about $6/bottle and I went through about 6 bottles to do 16 sq. ft. This will keep your pennies from getting damaged. I’ve also read about people using an epoxy to seal the pennies. I actually used the polyurethane but in this post I cover several options for sealing the penny floor. Here’s a photo of my template. You can see in the middle of the picture where I actually pieced 2 8.5x11″ printouts together, then used packing tape over the whole entire piece of cardboard to keep the glue from sticking. My cardboard is too short, so I have to make the squares in 2 applications. 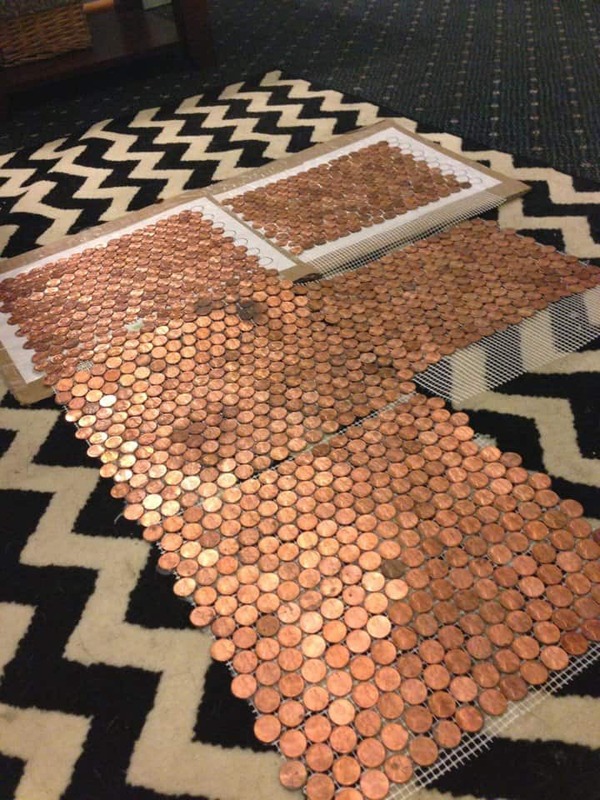 Creating a penny floor template was the key to my success in this project. 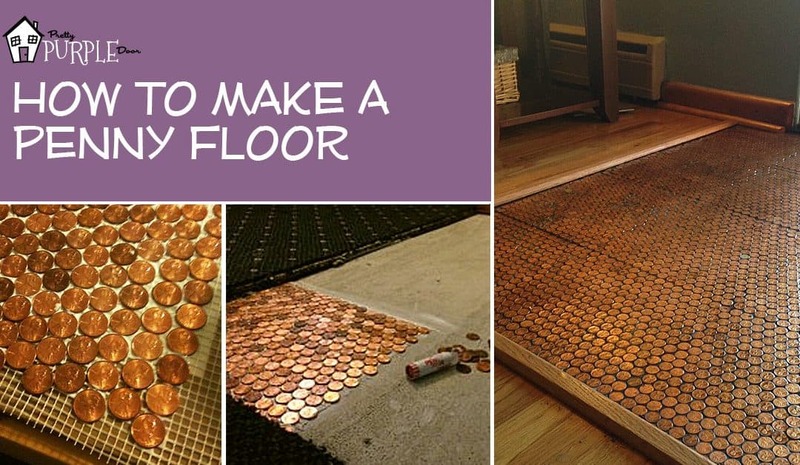 Now… why would you use a template instead of just gluing down the pennies right on the floor? Well, if you want to glue your pennies right to the floor, you need to work very quickly. I chose to do this project on weekends when I had free time, so the penny floor template was essential to my success. Using the mosaic tile mesh allowed me to work at my own pace, creating each “sheet” as time allowed. 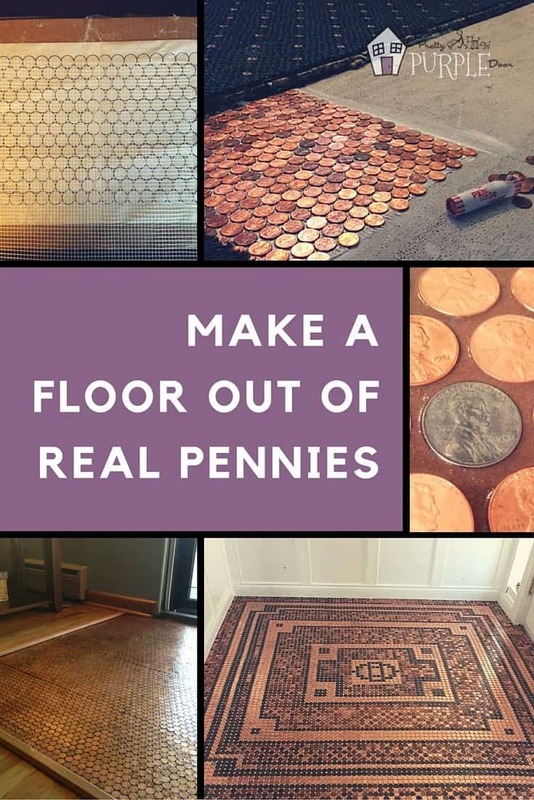 The penny floor template allows me to still have full use of my front door and foyer area instead of having it blocked off for weeks (or months) while I’m laying the pennies. The template really makes it more manageable to work on at your own pace. I printed two 8.5 x 11″ sheets of paper with the penny floor template on it, then carefully cut along the purple line on each piece of paper. 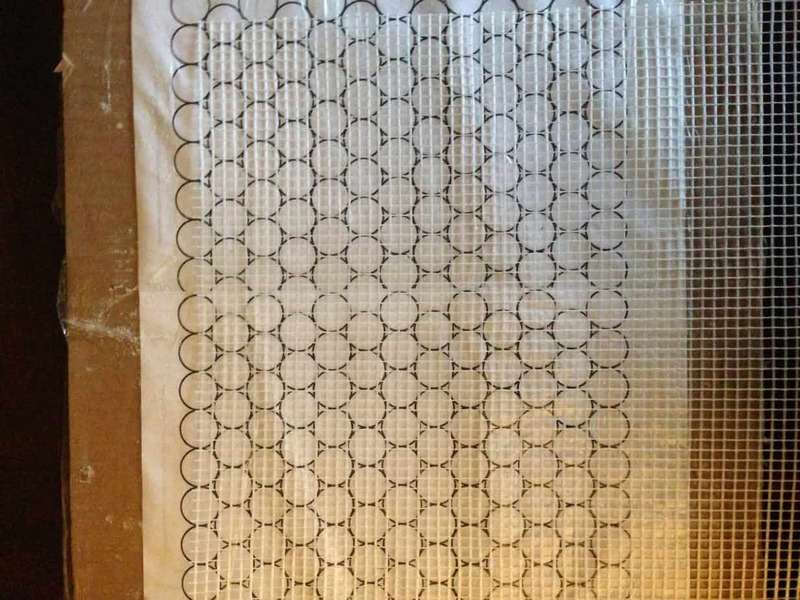 This allowed me to make a penny floor template to accommodate over 1 sq foot of mesh at a time. I carefully overlapped them so they lined up together, and layed them onto the cardboard. Now, you don’t want the glue to stick to the cardboard template when you are gluing your pennies, so I found the best way to prevent this is by covering the ENTIRE piece of cardboard with packing tape. Just tape the sh!t out of it. That way, when your glue is dry you can use a putty knife or a butter knife to carefully peel away the mesh from the penny floor template without very much effort at all. 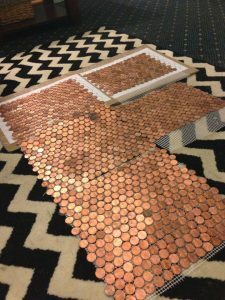 * Note: I made two cardboard penny floor templates for myself so that I could work on more than one square foot at a time. It was much easier for me to do this, and allowed the other piece to adequately dry without me getting impatient and wanting to start a new square. Highly recommend! My first batch of pennies on the mesh! So exciting! Once I created the penny floor templates, I cut the mosaic tile mesh into 1 foot squares. The mesh is just a plastic material so a simple pair of scissors did the trick. I pre-cut the whole piece so that I wouldn’t have to keep going back to measure. It’s all in the prep-work, so from here you are home free. 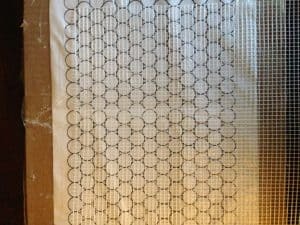 Simply line up the mesh on top of your new template, and use the Weldbond glue to adhere each penny to the tile one at a time. I found that using a rubber glove is really, really important. If you don’t, the oils from your fingers will tarnish the center of the penny where you pushed it down into the glue. You won’t notice it right away, but in a day or so there will be black dots in the middle. I didn’t think to pay attention to this and basically ruined 4 square feet. Everything has been perfect since I began using the rubber glove for the application. After you’ve finished that square, let it sit over night. I used a metal paint scraper the next day to carefully separate the mesh from the cardboard template. It’s inevitable that some of the pennies will come loose. Just save them, and when you are installing the floor you can use a dab of the Weldbond or the thinset mortar to put them back in place. Ultimately, I decided to lay all the pennies heads-up and facing the same direction. The only exceptions were Canadian coins or wheat pennies, which I put face down. I also collected the birth dates of friends and family who contributed, along with a few other important years of my life. For those “special” pennies, I’ve scattered them throughout the squares, but kept them heads up facing the opposite direction. It’s really subtle, but my friends had fun trying to find their birth year. I also added ones for the year I graduated college, the year my house was built, the year I bought my house, my parent’s anniversary, etc. Special years to me. Just a tip from experience, don’t try to clean your pennies after you’ve glued them. I read all these techniques for cleaning/shining up a penny and thought it would be a great way to get a consistent look. I ruined a few sheets trying this method out. This is what I’ve tried that you SHOULDN’T try. Ketchup. I’ve always heard that ketchup works wonders to shine up a penny. Unfortunately, this didn’t work for me. It barely took the tarnish off, and made the cracks in between all red and gloppy and gross. Baking soda + water. Again, I tried this to get the tarnish off some of the pennies using a paste that I rubbed on using a toothbrush. It ended up scratching a lot of the pennies, and took the orangy shine off of them. Now they are more of a pinkish/dull color… so I ended up not using that batch. Vinegar. This didn’t work for me either. Maybe try soaking them beforehand to see if you like the effect? The problem with shining the pennies is that the pennies are all from different years, therefore contain different amounts of copper and other metals. Because they aren’t consistent in what they are made of, they all react to the cleaning methods differently. My best advice is to be picky about which pennies you use from the start, and once they are on the mesh LEAVE THEM BE! *Update* 3/12/13: I found a really great product for cleaning the pennies (and believe me, I’ve tried everything). Although I like the idea of having old and new mixed together, if you want a super even look, or just need to clean some of the really dirty pennies, try Wright’s Copper Cream. It’s amazing!!! And it’s available at Walmart in the aisle with the Tarnex and Brasso (or online through the link above). *Update* 3/14/13: I received a message from one of my readers and she’s used Bar Keepers Friend on the pennies with great results. Thanks for the info, Nance! *Update* 3/17/14: I received a message from a reader who used pineapple juice as a cleaner with great success. The penny floor is installed just like any porcelain tile floor would be laid down. Here’s a video/instructions from DIY Network on how to lay a tile floor. Once I get to this stage, I will post a more detailed guide on how I personally installed my floor. 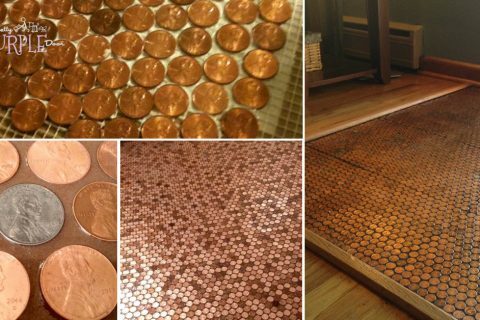 You don’t necessarily have to use a penny floor template. If the place you are putting them is out of the way, and you’d prefer to lay the pennies all at once, you can put them directly onto the floor using a paper thin coat of plain old wall mastic applied with a 4″ spackle knife. The bond doesn’t need to be incredible because grouting them and sealing them will hold them in place. I came up with some really different ideas for laying the pennies, so I thought I’d share with you. Do one whole sheet heads up, and one whole sheet tails up, creating a checkerboard effect when you lay them. Any wheat pennies put face down, while the rest of the pennies are face up. Add a dime every so often for some variation… it gives people something to look for! While I created a penny foyer out of this project, there are many, many different things you can create. I’ve seen a full kitchen floor created with just pennies. There’s even a bar in NYC that has a penny floor! 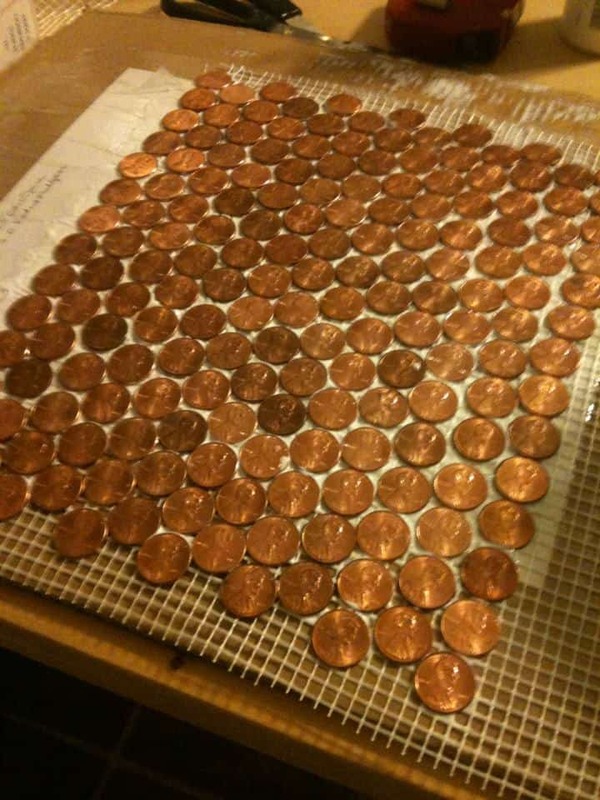 How about using the pennies as a backsplash, or table or a bar top? Or on a vanity or a tub surround? The possibilities are endless! Good luck, and I hope this penny floor template helps to make your process easier. Please feel free to post your pictures when you are done. I’d love to see them! Here's a link in case you're ready to purchase your penny floor template! Great post!, however, high quality grout is NOT an adhesive. A quality thinset should be used, if you are grouting. Just like a regular floor tile. As I was looking at mesh, i found the fibatape at Home Depot. Have you heard of anyone using that versus the mesh? The pricing is a little cheaper than even buying from Mosaic Art Supply. Everything that i found did not list metal for the Weldbond, what made you use that? I was looking at Gorilla Glue vs. Weldbond. Thank you for a great article, you helped me talk my husband into doing this on our screened porch! Amy – your template (I just bought the pdf) has the pennies nearly touching or touching. I’ve seen others with wider gaps. I’m not started yet but concerned that there will not be enough grout to hold the pennies or to keep the grout stable. Even tiny standard tiles have a continuous gap so the entire tile can be surrounded by grout. Your thoughts? I see a lot of talk about no sand grout but my tile guy says sand grout is what should be used? Hi Michael. The pennies will fit into the black lines. So anywhere there are lines on the template will be spaces for grout. The pennies won’t touch and will look exactly like they do on my own floor, as that’s why I made the template. Hope that answers your question! For cleaning penny I use a reloaders brass tumbler with medium. works great pennies come out super shinny. Can the penny floor be done on a patio cement slab? How slippery is the floor when finished?? Not any more slippery than hardwood floors. Love this, I would like to recommend Tub and Tile from Melaleuca for cleaning the pennies. It does an awesome job and is non-toxic. I am going to do a project like this soon. Thanks again. I love this idea and feel very confident in all aspects of carrying out the project for my kitchen floor, I do however have two concerns. Once the floor is coated is it slippy? And is it susceptible to being scratched, I understand from your threads it’s hard wearing to everyday ‘traffic’, but I’m dubious that if ever my appliances need to be dragged out for any reason that they’ll leave scratches, particularly washing machines as they’re very heavy? Sorry I’m not familiar with your currency maybe someone else will be more helpful. I’m sorry I can’t help with the epoxy. however, I’ve had the floor installed for 4 years in my foyer and walk on it every day. Even my 100lb dog trampled it, and now my 40lb dog. It gets a lot of use and I’ve never had an issue with it “wearing” where we walk. Hi there, thanks so, so much for this thread. I’ve just completed my bathroom floor, and I love it!! This is super helpful for the setting process… One thing I wondered (having laid it at different times. A few hours a day etc), it’s left the first ones laid dirtier. Eek!! I wondered please, the best cleaning products? Also, what’s the best cleaning product in general? For once the varnish has been set? Hi Catherine! Thanks for writing! My favorite product personally for cleaning the pennies has been Wright’s Copper Cream, so that’s what I would recommend. You can rub it on lightly and buff it off so it’s a good way to clean up the pennies without making them all completely new looking. Some others have used Bar Keepers Friend, Pineapple Juice, Vinegar, Baking Sode + Water, or Ketchup with good results. Don’t forget to submit your picturesto the penny floor gallery when it’s done! haha… funny comment. I’m so sorry it didn’t work for you. I’m sure you put a lot of time into it. Honestly, you have nothing to lose by trying the epoxy at this point. I’ve seen it very successfully done on bar tops. Since you are ready to burn the whole thing down, maybe now is the time to try it. If you do, please let me (and everyone else) know how you’ve done. If you check out Part 2 or the Gallery I believe there some comments there about epoxy use. Hi Joe. What type of Poly did you use? I used a quick drying water-based poly and didn’t have a problem so maybe it’s the type of poly that you used? I’m not sure. Can i do this as a shower floor? This is fantastic site! Thank you all for great ideas and tips. Perhaps I can add one that I found on you-tube; the discoloration on pennies can be caused by touching them by bare hand (leaving residue of oil from the skin). The person suggested lying pennies using rubber gloves. I have a question of my own…. Did anyone tried using pennies in a shower stall/walls, and if so…did the steam/water caused any problems? Did anyone used the same products as for the floors? Thank you and keep on writing please? Hey Carol, what epoxy did you end up using? How did the 2-part Poly work out Nicki? We have pre-made penny tile sheets at KVS Mint Coin Tile. Custom, mosaics, and nickel sheets available as well. Check us out at http://www.kvsmintcointile.com. Hello anyone? I will do grout but never grouted before. I just did a test strip and the non sanded grout doesn’t quite bring the gap areas completely up to the penny level. Will the poly fill in the gaps? I have put down over 60k pennies idividually and my back is killing me. I usedon’t the polyurethane on my penny floor, in the bathroom. After my first time using it after several weeks, only hours later, the urethane began peeling from the pennies. 🙁 I’m sorry to hear that. It’s important to remember that not all polyurethane is equal. I can only vouch for the one I used personally. I have also talked to some followers that have had trouble with the polyurethane because they did not shake/mix it enough. Have you come up with a solution, or is there something I can help you with? Or were you just commenting to say that it didn’t work for you? http://www.kvsmintcointile.com carries the penny tile in pre-made sheets. In that case, Missy, it might be wise to do a test piece first, say covering a small night table or some such, to see how it all works out. Here’s the missing Science Class Magic for cleaning the tarnish off pennies- or rather, making it disappear…: use vinegar with some salt added. First try it by putting some vinegar in a bread plate, sprinkle in some salt, and drop a few dark pennies. Thee don’t actually clean the pennies to any extent, but instead changes the chemical formulation of the oxides that discolour the copper such that the oxides are now fairly clear. A really sharp eye will notice that the end result isn’t quite a natural copper, but it’s close enough. Great project! I am really curious if your thin set over existing tile grout lines approach worked, Brandon. I really don’t want to demo my 12 X 12 tile on concrete slab bathroom floor. Pennies are thin enough that installing on top won’t raise the level of the floor too much. Does anyone have a suggestion of any other product that could be used to smooth out existing grout lines to give a flat surface on which to lay the pennies? Somewhere I saw the mention of Copper cleaner (bar keepers friend and the likes), would this step be done before setting the pennies or after the placing or grouting, prior to sealing? Thinking of starting this project… The finished result is incredible! Odd question though…. do the pennies feel smooth to walk on with bare feet? I am worried about being able to feel the grooves in between each coin. Does that make sense? I will have to decipher the sealant products as I am in the UK and I think a lot of the products mentioned here may have different names. It won’t be slippery, the texture of the pennies and the spaces between them and the grout is still felt through several coats of poly. Which sealant should I go with? I am just about to start my wet room floor and want to make sure that whatever sealant I use is going to hold up against the shower, etc. This blog has been so helpful in getting me started – I’ve even purchased the template. Hi Kate! Thanks for purchasing the template – you rock! I have seen several home owners use Epoxy for wet bathroom areas. The only one I’ve used is the Minwax Poly for floors so that would be my recommendation. Do several coats. You need one of these for the wall! Thank you for such a detailed description of your process. Your information gives me much greater confidence in tackling something like this myself. Based on the date of this post it looks like your floor was completed about 1 year ago. Can you tell me how your floor has held up over time? Any problems, regrets, changes you would make? How much traffic does your foyer get? Thanks in advance for any information you can provide. Hi Marcus. The floor looks great. If it ever needs it I can give it a light sanding and reapply the poly. However I haven’t had to do that yet. The floor gets daily use. It’s right in my front door area. I also have a 100lb dog that constantly tramples it. No problems. Hope that helps! just wanted to throw this out there… for cleaning the pennies… you can do handfuls at a time with this method before you lay them in your grid.. you will need a glass bowl. lay the tin foil in the bottom of the bowl add the hot water and the washing soda ..
let any pennies you need to clean touch the tin foil no scrubbing no mess. in seconds they will be clean and shiny. just rinse and dry..
Good luck! Post a photo when it’s done!! What 2 part poly did you use, and are you happy with it? i am doing a large dining room floor. Any reason why the pennies can not be configured tightly, touching one another? Hi David, there’s no reason why you can’t have the pennies touching. Personal preference. Wondering if the poly held up. I need to seal mine but am so confused on what to use. It’s a bathroom project. I’ve been told that so many products will/won’t work. My floor isnt perfect but I worked hard on it and want it to last. It’s only about 22 sq ft but I have pets and a hubby that is rough on almost everything. Hi! I wondering if it would be possible to skip the grouting process altogether as it seems to me if you seal it with polyerithane that it will work it ways in between the pennies. I personally wouldn’t skip the grout. Would you not grout between tile? I believe it adds more stability to the floor or surface. Also, it makes the surface look finished. However it’s a personal preference, and this is just my opinion, so you can try it any way you’d like. Haha hang in there! I used the wrights copper cream. No residue. Wipe it up really good because once you seal it that’s what it will look like forever. No yellowing for me with the poly I used. And relax– the little imperfections are things you will appreciate over time. Did you use an oil based or water based poly urethane? Thanks for the info about the cleaner. I have manged to make this a Zen endeavor (master level upon completion) For anyone that, like me, used the black grout before the poly procedure, the only thing i found to get it off the pennies, was fine steel wool… And lots of wine. For the people that have problems with grout sticking to the pennies… Just like stone tiles – when using black grout you always have to seal the floor before grouting this will not let the black grout stick and penetrate the stone. For pennies If you are using poly then poly it BEFORE the grout, then after the grout also. Thank you for all the step by step instructions. I’m almost finished with my penny floor! My question is… Why do you lightly sand between sealing applications? Is this step necessary? Hi Heather. Sanding between coats of poly makes sure that if you had any ‘drips’ that you recreate a smooth surface. The sandpaper also gives the next layer of poly something to stick to. Hope that helps. Hi Lori. I sent you an email. Sorry you are having problems I would be happy to email you the template if the link is still not working for you. How long does it take for the poly to set up on the pennies? Awesome! Thanks 🙂 I want to do the backsplash in my kitchen and was curious as to how long it would take to set up. What sealant for the pennies?? Polyurethane? Brand? Help!